You’ve got your next dive all planned out but need to buy a SCUBA diving suit. Not sure what you need in a scuba wetsuit? No worries! You’re probably thinking, “What wetsuit thickness do I need?” or “what type of wetsuit do I need for diving?” We’ve mapped out the basics on how to buy a SCUBA diving wetsuit to make your experience a little bit easier. As a starter, we have this handy wetsuit water temperature guide below which can help you map out just what wetsuit you need for your dive! Keep in mind that some factors other than water temperature could affect the wetsuit thickness or type of scuba diving wetsuit needed. Tolerance for Cold – A thicker or thinner wetsuit may be required or desired as everyone’s tolerance for the cold varies. If you are someone that tends to feel cold, err on the side of going with a thicker wetsuit. Otherwise, using the wetsuit thickness table should be a very good place to selecting the right wetsuit style and thickness. Performance Expectations – Something you will have to take into account is the demand for high performance. The less wetsuit (meaning thinner and less coverage) worn will translate to high performance. If performance is at the top of your wetsuit requirement list, you may be inclined to buy a slightly thinner wetsuit or go with reduced coverage as applicable. Alternatively, if budget can accommodate, a higher-end wetsuit can provide you with appropriate insulation and very high performance. This now leads us to types of wetsuit products! Rashguards and baselayers are primarily worn under wetsuits or alone, as sun and/or abrasion protection. These items do not provide thermal protection when worn alone, so they are only appropriate for water that is typically 75F+. These items provide wetsuit coverage to areas of the body. When a little insulation is needed and water temps are in the high 60’s, any springsuit, short john (or jane), top or bottom would be perfect. They also work well in heated swimming pools that just aren’t quite heated enough! We also offer SCUBA Combos so you can mix and match your scuba diving wetsuit! From here you should be well on your way to choosing the right scuba diving wetsuit for your next dive. If you need some more help, we’ve got you covered! Give us a call, email (service@wetsuitwearhouse.com), or live chat! The type of suit you will need depends on where exactly you are diving (ocean, lake, quarry, etc.) and the water temperatures. We would also need more information about your size like your height and chest measurements in order to help you get what you’re looking for. Give us a call at 866-906-7848 or email us at service@wetsuitwearhouse.com! You can find our size charts on a product page in the size chart tab or even under the description of a certain product. Thanks for asking! And feel free to contact our customer service either via phone, 866-906-7848, or email service@wetsuitwearhouse.com if you need more help. What suits keep the water out completely? I have an allergy to pool chemicals and would like to swim indoors for excercise. Is this possible with one of your suits!?? Unfortunately we do not have anything that will provide you with a full dry experience while swimming in the pool. Thank you for reaching out and asking though! We hope you are able to find something that will help you! A 5/4/3 or a 4/3mm suit should do the job for surfing. If you plan on diving in the same area, you will need a thicker wetsuit, at least a 7mm or a drysuit (which we do not sell). For surfing, check out these suits: https://www.wetsuitwearhouse.com/wetsuits/category/oneill-wetsuits.html#filter:suit_type:Fullsuits/filter:thickness:5$252F4mm/filter:thickness:4$252F3mm. If you have any additional questions or need help, please feel free to reach out to our customer service team via live chat, phone (866-906-7848) or email (service@wetsuitwearhouse.com). Thanks! I need a size 3xl or 4xl but I’m only 5′ 9″ tall is there such thing as a short ? I need 7mm Full since I live in Idaho and the waters are a little colder. Thanks for reaching out! Unfortunately we do not offer a short in the 3XL but we do offer 2XLS. The only two suits we have in stock in that size are a 5mm and a 3/2mm. I know you were looking for a 7mm though. An option to look into would be a custom wetsuit (pricey but it will cater to your measurements). You can check those out here: https://www.wetsuitwearhouse.com/wetsuits/category/custom-wetsuits.html. Thank you! Hi Lauren, Another enquiry, from UK. I am interested in the Mens 7mm NeoSport 2 piece John & jacket, but am unsure of the size, from the size chart, I am on the top end of a 3XL, should I be looking for 4XL? I’m 6’3″, Chest 48″, Waist 44″ and 266 lbs. I train Newfoundland Dogs to rescue people for charity fundraising events, and some days spend 6-7 hrs in and out the Sea, lakes and Marinas around the UK West coast. 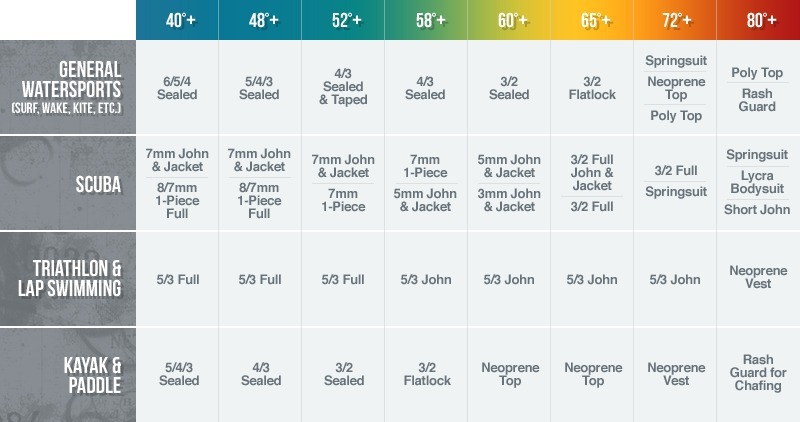 Based off of your measurements you definitely are at the top end for a 3XL for the 7mm NeoSport John & Jacket. Unfortunately they do not make it in a 4XL. Once you hit the water, the wetsuit will slightly expand. I think going with the 3XL with that suit will be fine for you. But if you’re a little hesitant, we also offer this 7mm Thermoprene wetsuit in a 4XL: https://www.wetsuitwearhouse.com/PROD/A870MB.html, but it is a full wetsuit, not the john and jacket combo. If you have anymore questions, please feel free to reach out to our customer service team either via live chat, email (service@wetsuitwearhouse.com) or call 866-906-7848. Thank you! hi, i am looking for a wet suit to do some underwater dredging in a very cold creek, the water is some where around 35 maybe 40 degrees on a normal winter day, also i will need a mask and i want a small oxygen tank to work as a all in one, but i am so clueless and need some serious directions and advice. please can you help me in what i need thanks so much for your time. Thanks for reaching out and asking! Since you’ll be in some cold waters, we recommend wearing 7mm or even an 8/7mm wetsuit. This 8/7/6mm Women’s XCEL ThermoFlex TDC Fullsuit is a great option: https://www.wetsuitwearhouse.com/PROD/WQ87XCU5.html. You’ll most likely want a pair of 7mm thick wetsuit boots to go with this. Here’s our selection: https://www.wetsuitwearhouse.com/wetsuits/category/wetsuit-boots.html#/filter:gender:Women's/filter:thickness:7mm. If you have any more questions or concerns, please feel free to reach out to our customer service team either via live chat, email (service@wetsuitwearhouse.com) or call 866-906-7848. Thank you!